Vessels may only be identified as either a State Registered Vessel or a Federally Documented Vessel – NOT BOTH. When a vessel becomes federally Documented, the State Registration Numbers and Letters must be removed. The State Validation Sticker showing proof of paying sales tax may still be displayed on the vessel in accordance with the individual state’s regulations. Letters & Numbers must be read from left to right. Note: if the background is multicolored or patterned, a block out area of a single color may be required to facilitate readability. Characters must be separated by the width of one letter or number – not including the number one (1) or capital letter (I). Note: Use either a blank space or a hyphen. Validation sticker must be visible and placed within six inches of the registration numbers. Placement either in front of or behind the numbers is determined by state regulation. The Registration Numbers, Letters, and Sticker must be permanently attached and on the forward half of the vessel. Adhering registration numbers and stickers on glass or plastic windows or using placards (signboards) are NOT considered permanent and can no longer be used unless they are bolted or screwed in place on the hull or superstructure (including on dinghy). Bolted signboards cannot be attached to railings. Inflatable boat manufacturers should be contacted for letters and numbers made of the same material/adhesive as the boat to attain permanency. Validation stickers issued by states can be adhered to metal or plastic plates and mounted on grab straps with nonreversible wire ties, but must be within 6 inches of the registration number and visible to law enforcement officers. Contact your state for guidance and acceptability. Can be made by the use of any means and materials which result in durable markings. The application for documentation must include a name for the vessel composed of letters of the Latin alphabet or Arabic or Roman numerals and may not exceed 33 characters. The name may not be identical, actually or phonetically, to any word or words used to solicit assistance at sea; may not contain or be phonetically identical to obscene, indecent, or profane language, or to racial or ethnic epithets. Must not be less than four (4) inches in height (all characters). Can be on the transom or either side of the vessel. The vessel must have the official number permanently affixed in block-type Arabic numerals of not less than 3 inches in height, preceded by the letters “NO .” on some clearly visible interior integral structural part of the vessel. The “hailing port” must include a place and a State, Territory, or possession of in the United States. The state may be abbreviated. Note: There is no requirement for block letters or any other restrictions to type, font, or color for federally documented vessels. The name and hailing port of a recreational vessel must be marked together on some clearly visible exterior part of the hull. Many recreational vessels will place the vessel name and hailing port on the stern, and vessel name on both sides of the bow, which is required for a commercial vessel. Although not required for a recreational vessel, this is an acceptable option. The above requirement for vessel name and hailing port to be CLEARLY VISIBLE may necessitate duplicating the name and hailing port on either side of the hull. 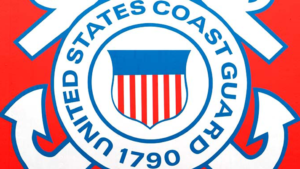 When dinghies are stored on the swim platform or transom causing the Vessel’s name and hailing port to be obscured from view, there is no Federal requirement to place the name and hailing port elsewhere. That is a Law Enforcement issue only. Stenciling on the bottom of the dinghy is not considered a permanent marking. Federal Vessel Documentation is a federal issue and is not open to enforcement or interpretation by the state. for on the transom. just for recreational use. must I have this documented,registered ?? In the states…Registered at least with your state which issues annual tabs, like a license plate that shows you’re up to date with the fees.